I had been wondering about the roles of the Buddha and the Christ on this planet. I asked to be taught about this. I really wanted to understand. In answer to my request, one day when I was looking for a quote I had read about the Buddha and the Christ, I came across this information. I never did find the quote I was looking for, but my inner teacher led me to an enlightening understanding I had not previously had. I want to share it with you. Basically the Buddha and the Christ enlightened two different areas of human development. Both of these areas must evolve in each of us, if we want to experience our full potential. I hope you find this food for thought a delicacy like I did. It synthesized so much for me. The Buddha and Christ are not at odds! They work "hand in hand," "heart to heart," and "head to head," with each other ... and ... through us! We are all linked together by our evolutionary process toward the One Life expressing itself in many Divine ways. May we be blessed and may the Spirit of Cooperation continue to prosper in our midst. May the Greatest Good come forth! The Buddha made the first planetary effort to dissipate world glamour. Glamour is astral in character and deals with the emotional body and the desire nature. Glamour is dispelled by the pouring in of the light of reason. Buddha used three methods to dissipate glamour and prepare the personality to be a conscious expression of divinity. The withdrawal or abstraction of the brain consciousness from the things of the senses and from the calls of the lower nature. The imposition of a new rhythm or habit reaction upon the cells of the brain which renders the brain unaware of the lure of the world of sensory perception. The freeing of the soul from the thralldom of the form life, and the subordination of the personality to the higher impulses. The attainment of that state of consciousness where balance is seen, and neither pleasure or pain dominate. Through dispassion, the emotional nature is rendered immune from the appeal of the senses and desire fails to deter the soul from its rightful task. Dispassion frees one from bias and allows one a calm, impartial attitude. The process of differentiating between the form and the Life, between the soul and the body, between the sumtotal of the lower manifestation (physical, astral and mental) and the real self, the cause of the lower manifeastation; that faculty whereby the self recognises its own essence in and under all forms; one of the highest faculties in humanity. When these three methods of the Buddha are used, the light of reason pours forth into the emotional body dispelling glamour and the rule of wisdom is brought in preparing the disciple for initiation. The Christ made the first planetary effort towards the dispelling of illusion. Illusion is of a later emergence than glamour. Illusion is primarily of a mental quality, and is characteristic of the attitude of mind of those people who are more intellectual than emotional. The soul illumines the plane of the mind and the plane of intuition (where ideas are contacted), so they stand revealed to each other. Illusion signifies the reaction of the undisciplined mind to the newly contacted world of ideas. Ideas come to us from the plane of intuition. They are vital incorporeal Beings related to the Will aspect. They have no substance themselves, but they give figure and form to shapeless matter and become the cause of manifestation. Illusion is shattered by the intuitive recognition of reality by minds attuned to it. The whole is made up of individuals; each individual is an integral part of the whole. The value and importance of the individual is understood because each has a real sphere of influence. Individuals learn to perfect themselves, and thus enrich the group with their own unique contribution. A process of developing inclusiveness. The realization of an increasing unity with all that lives. The selfish personality fades out as one aspires to the greatest good for all. This second result is a group activity. One loses sight of the little self in group work and endeavours to include all. One passes through the portal of initiation in group formation and allows the selfish personality life to be lost in the group life in order that the greatest good for all may be manifest. The final result of the work of the Christ is to be found in our identification with the whole. He said, when on Earth: "I and my Father are One," and in these words epitomised His entire message. I, the Individual, through Initiation, am Identified with Deity. With the light of intuition Christ dispelled illusion and brought the mind into relationship with Deity. The Buddha ... dissipates glamour ... the Method ... Detachment, Dispassion, Discrimination. The Christ ... dispels illusion ... the Result ... Individualization, Initiation, Identification. It is interesting to note that the work of the Buddha is expressed in words all beginning with the fourth letter of the alphabet, the letter D. The sense of personality is achieved; the quaternary is transcended, and the Buddha gave us the reason for this transmutation and the rules. The work of the Christ is expressed for us in words beginning with the ninth letter of the alphabet, the letter I, and this number is the number of initiation. These things happen not idly but all have their underlying purpose. The work of the Buddha and the Christ must now be intelligently carried forward by a humanity wise enough to recognise its dharma ... the awareness of the soul's perfect line of development; the inner nature unfolding itself. There is the emergence of a new kingdom in nature, the fifth kingdom; this is the Kingdom of God on earth or the kingdom of souls. It is precipitating on earth and will be composed of those who are becoming group-conscious and who can co-operate in group formation. This will be possible, because these people will have achieved a self-initiated perfection (even if relative in nature) and will be identified with certain group expansions of consciousness. It will also be because they have arrived at a love of humanity, just as they have loved themselves in the past. 1. Individual effort, made by the individual disciple, using the technique of detachment, of dispassion and of discrimination which the Buddha taught. 2. Group initiation, made possible by the self-initiated effort of individual disciples, following out the injunctions of the Christ and leading to a complete subordination of the personality and of the unit to group interest and group good. 3. 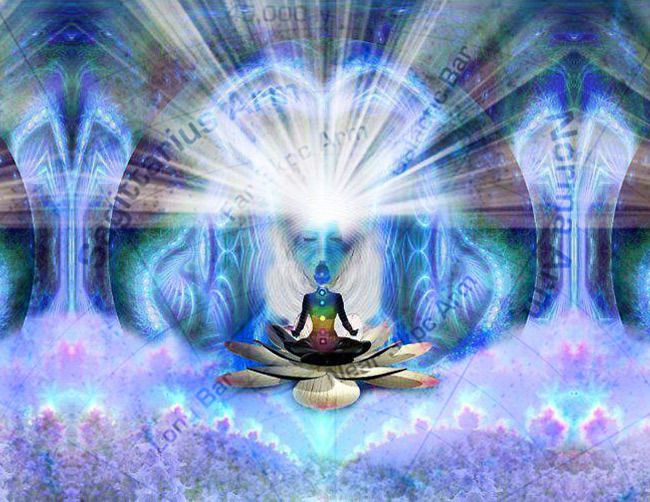 Group endeavour, carried forward as a group, to love all beings and to apprehend and understand the true significance of the Aquarian technique of group love and work. A linking up of our minds in connection with the work of the Buddha and of the Christ serves a useful purpose and gives us all a glimpse and an indication of their two systems of unfoldment ... one preparatory to accepted discipleship and the other to initiation,which would be sequential and interrelated. We continue to mount higher. It is this wisdom and love which renews humanity each Wesak.